Ordered by the House of Commons to be published on 18 June 2014. Members present: Mr Laurence Robertson (Chair); Mr Joe Benton; Oliver Colvile; Lady Hermon; Kate Hoey; Jack Lopresti; Naomi Long; Dr Alasdair McDonnell; Nigel Mills; Ian Paisley; Andrew Percy. Witness: Rt Hon Peter Hain MP, former Secretary of State for Northern Ireland, gave evidence. Q1696 Chair: Mr Hain, you are very welcome. Thank you very much for joining us. You are aware of the inquiry which we are carrying out, so no need for a long introduction from me. I understand that you would like to make a brief opening statement. Please carry on. Mr Hain: Chairman, thanks very much; I am grateful for the opportunity. Although I have not had the opportunity to follow all of the sessions of the Committee, I understand that our Government has been accused of doing a shabby, one-sided deal with Sinn Fein behind the backs of Parliament, the Northern Ireland political parties, victims and the public at large. It is argued that as a result at least one alleged terrorist, John Downey, has evaded justice and that therefore many more will also have done so. It is further alleged that by involving the Royal Ulster Constabulary and the Police Service of Northern Ireland in this process, the Government politicised them as well as the law officers and civil servants who were involved in the administration of the scheme. I utterly reject these accusations. I believe that they spring from a fundamental misunderstanding about the core issue; a fundamental misunderstanding which I trust the Committee will correct. In the controversy which has understandably raged since the Downey fiasco, there has been a complete failure to distinguish between, first, those who were genuinely on the run—those whom the police were pursuing on the basis of evidence against them—and secondly, those who may or may not have committed pre-Good Friday Agreement troubles-related crimes but against whom there was either no evidence or insufficient evidence to detain, let alone prosecute, if they came back into UK jurisdiction. For some, the difference between these two categories is immaterial, but it is actually fundamental and I ask the Committee to acknowledge that. The Northern Ireland (Offences) Bill, which I introduced in the Commons on 9 November 2005, was designed to honour commitments the Government made at Weston Park in 2001 and published in detail after the Hillsborough talks in April 2003. Had I not withdrawn that Bill on 11 January 2006, it would have dealt with the first category of cases: namely, those who had committed crimes or who were wanted by the police. That key on-the-runs issue Sinn Fein wanted dealt with is still outstanding and has still not been resolved. The second category came under the administrative scheme which, as the Attorney-General, the right hon. and learned Member for Beaconsfield, confirmed to the House on 26 February 2014, was entirely lawful. It was essentially a screening exercise that in the Downey case obviously went wrong. The administrative scheme processed people on behalf of whom Sinn Fein inquired as to their status, were they wanted or not, at the time of asking. It was no more than that. The function was in the title—‘Administrative’. In the case of those who were not wanted, the letters they received contained statements of fact, after careful checks by the police, the Attorney-General’s office and Northern Ireland Office officials. They were clear that, should further evidence come to light, these letters would no longer be valid. Consequently, they were emphatically not get-out-of-jail-free cards nor amnesties, as indeed has been made clear to this Committee by three Chief Constables, the Attorney-General’s office and the DPP for Northern Ireland. May I stress that at no time—at no time—was I aware of the names of those being processed under the administrative scheme, nor the timing involved nor the nature of the assessments made. Those were matters for the police, the law officers and officials. It would have been wholly improper for me to have inquired about or got involved in that process under Operation Rapid—a PSNI label, incidentally, of which I was unaware at the time. As it happens, the Downey letter was issued a month after I moved to another Cabinet post. Further, I emphatically reject the suggestion that I in any way misled the House following the withdrawal of the Northern Ireland (Offences) Bill in 2006. The administrative scheme, in whatever iteration over time, including Operation Rapid, never was an attempt to resolve the first-category issues set out in that Bill and those issues, I repeat, remain unresolved. This distinction between the two categories lumped together under the generic title of “on-the-runs” is, I believe, absolutely central. Because I had no direct involvement in the mechanics of the administrative scheme, I do not think there is anything I can usefully add to what those who were directly involved have already said in evidence to this Committee and to Justice Hallett’s review. What I do have experience of is being part of a Government in which I am proud to have served as Secretary of State for Northern Ireland that had the lead responsibility—along with colleagues in the Irish Government, to whom I pay tribute—to negotiate and deliver a political settlement following not decades but centuries of division, and at times deadly conflict. It often involved taking difficult decisions in real time, but what I am absolutely certain of is that at all times those were decisions taken honourably and within the law. We can unpick and pick at aspects of that process as much as we like, but if we analyse them in isolation, as if the world is other than it was then, I am not sure where that will take us. Finally, having appointed the interim Victims Commissioner in 2005 and commissioned the comprehensive Eames-Bradley Consultative Group on the Past, which reported in 2009, I am very conscious of the harrowing legacy of horror and evil that victims and survivors continue to bear. I utterly reject any suggestion that I or anyone with whom I served in Government was indifferent to their suffering. It was precisely to ensure that there never again would be victims in the future that I am proud of everything I did to achieve what most people thought impossible, the 2007 settlement, which has now produced over seven years of relative peace and stability. Q1697 Chair: Thank you, Mr Hain. You have given quite a comprehensive statement. I wonder if I could ask you a couple of questions to start with. You referred to the two categories of people—on-the-runs. You will be aware that, in front of this Committee, Assistant Chief Constable Drew Harris said that the police connected, through intelligence—nothing more than that at this point—95 people who had received letters with almost 300 murders. Which category would you put those into? Mr Hain: If they received letters, they quite self-evidently came into the administrative screening, but they received letters because the police and the Attorney-General’s office—all those others involved in making the necessary checks that the scheme required in order to be proper and lawful—found that there was no evidence sufficient to bring a prosecution. That is the test. I do not know about intelligence or anything of that kind in respect of these cases, although I note your point. But the point, whether or not there was intelligence, was whether that intelligence would produce evidence that could stand up in court. If it had produced evidence that could stand up in court, the process should not have been applied to those individuals. They should have been prosecuted, as indeed many were. In those instances where people who came under the scheme did not receive letters because there was evidence against them and they were still wanted, they did not receive letters because the administrative scheme could not be applied to them. Q1698 Chair: But that is a high percentage of those who did receive letters. The police are now connecting them through intelligence to almost 300 murders. That is not just one case like the Downey case; that is a lot of people and a big percentage of the number who have received letters. Mr Hain: I think, having looked at the evidence that came before Justice Sweeney in the hearing with which you are very familiar, that a catastrophic and, in my view, inexplicable error was clearly made in the John Downey case. I do not think there is any doubt about that. I find it hard to understand how Mr Baxter, for example, was unable to pass on the information that the Metropolitan police computer clearly had, because checks were made. But that is in a different category from intelligence, which may or may not be accurate and which may or may not produce evidence that could stand up—if it could have produced evidence that could stand up in court, they would not have fitted into that category. They would have been rejected for consideration to be sent letters. Mr Hain: I don’t think so. Chair: Well, our advice is that it would be. Mr Hain: I don’t know; I am not a lawyer. I would be interested to know the advice that you have had. As others, such as Sir Hugh Orde, the former Chief Constable, for whom I think we all have massive respect, have made clear, if you look at the content of the letters that were received, it was very clear that it was on the basis of evidence known to the PSNI at the time. If that evidence changed, a prosecution could be brought, which was clear to those who received the letters. Q1700 Chair: You are aware that the present Chief Constable and two previous ones, to whom you referred earlier, did not know that letters were being sent to people. They were of course asked to carry out investigations, but none of those three were aware that letters were being sent to these individuals. Does that surprise you? Mr Hain: Frankly, I didn’t realise that they didn’t know. I didn’t realise that. As I said, I was not involved in the mechanics of the scheme. Q1701 Ian Paisley: First of all, Peter, can I just say that I welcome the fact that you have come to the Committee today—even though there are things on which we will starkly disagree? Unlike some people who are on the run, even from this Committee, I think I do welcome the fact that you have shown this Committee the respect it deserves. Ian Paisley: I know you did. Mr Hain: I would have come right at the beginning, but you have chosen to have me at the end, which is fine. Q1702 Ian Paisley: Absolutely. I want to turn directly to the issue of John Downey and your knowledge of that particular case. You said in your opening statement—I think I am quoting you accurately—that at no time were you aware of any of the names that were being put on the list. Could you tell us when you first became aware of John Downey and him being put on to this list? Mr Hain: When I was approached by his solicitor. Ian Paisley: When was that? Mr Hain: At some point at the end of last year. He made it clear that I would be in receipt of a subpoena should the case come to court in order to describe what I understood about the issue. I had never heard of him before. Ian Paisley: Never heard of him before 2013? Mr Hain: Before 2013. Before his solicitor, Gareth Peirce, approached me. Q1704 Ian Paisley: In paragraph 11 of your witness statement to Mr Sweeney you seem to suggest that you had been made aware that John Downey, the on-the-run applicant in 2007, received the letter in the same terms as other persons at the same time. That appears to have been written in 2013. That was your awareness. Would you often read letters that you would receive as Secretary of State from the Attorney-General? You would have read them personally? Mr Hain: I would think so. Ian Paisley: You would think so. Mr Hain: It is very unusual for the Attorney-General to send a letter to a Secretary of State. Q1705 Ian Paisley: That is what I would have thought. I am looking at a letter dated 22 February 2006. 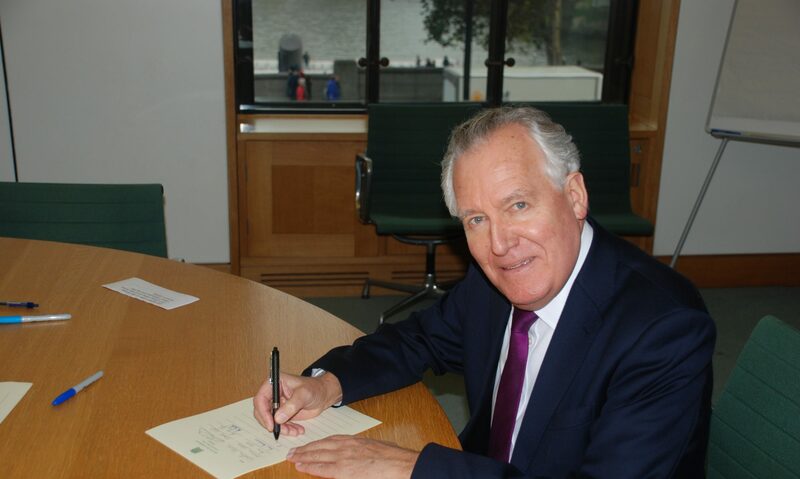 It is addressed to Peter Hain MP, Secretary of State for Northern Ireland and starts, “Dear Peter”. It goes down the list and says that John Anthony Downey, DOB 19/01/1952, living in County Clare, is wanted for arrest and questioning in respect of serious terrorist offences and how he wants to go on to this list. But you are not aware of this until 2013. Mr Hain: To be frank, whether it is an oversight on my part, you are reading from a letter that I cannot recall, Ian. It obviously exists or you wouldn’t be reading it out. Q1706 Ian Paisley: We got it as part of the tranche of evidence in this case. Mr Sweeney has seen it. No doubt you have seen it. Mr Hain: I haven’t seen it, no. Ian Paisley: You have never seen it? Mr Hain: No, I am not saying I have never seen it. I am saying I can’t recall it. Q1707 Ian Paisley: It is signed off in very personal terms to you from the then Attorney-General. Mr Hain: What was the purpose of the letter? Ian Paisley: The short title of the letter is “Sinn Fein list”. It then indicates that these are the persons who want to go on to the list. Mr Downey’s name is on the letter. There is a slight redaction which names some other people. We didn’t see the other people in this letter, but John Downey’s name is on this list. Mr Hain: I am sorry. I am not denying the letter exists if you have it, but I don’t recall it at all. Q1708 Ian Paisley: What I am saying to you is that if you saw that letter, the witness statement that you made to Mr Sweeney is inaccurate in one interpretation and someone else may say, “untruthful”. Mr Hain: I don’t agree with that at all. Mr Hain: I don’t recall seeing it. I honestly don’t recall seeing it. Q1710 Ian Paisley: So you don’t recall any private discussions that you may have had with Sinn Fein or with anyone else about John Downey? Q1711 Ian Paisley: It never existed. Your first awareness— because the first mention is always very important—was sometime in 2013? Ian Paisley: Yes. You’ve said that. But the mechanics are important. Mr Hain: I do not recognise that letter. Q1712 Ian Paisley: Are you aware that on your last day in office as Secretary of State, the decision to include John Downey on the list was made? Q1713 Ian Paisley: So there was no lobbying, no private nudging, no undertakings given? Mr Hain: No. I was never lobbied by Sinn Fein on behalf of any individual. Mr Hain: I am telling you that that is true, whether you believe it or not, Ian. If you are accusing me of misleading the Committee I think you should say so. Mr Hain: When was that? Ian Paisley: Way back in 1999-2000. You were not Secretary of State then. That was the first name and the scheme then emerged and developed. So the names are crucial in this as far as Sinn Fein is concerned. Mr Hain: The scheme could not have been applied to Rita O’Hare. It couldn’t have been because she was wanted. Q1716 Ian Paisley: That is right. That is how the scheme started. It emerged that the genesis was in Sinn Fein trying to get Rita O’Hare cleared. Mr Hain: I think you’ll find, although your knowledge of the history may be better than mine, that the on-the-runs issue, rather than the administrative scheme, was undoubtedly raised by Sinn Fein possibly as early, as I understand it, as 1999, and Rita O’Hare featured in that. Mr Hain: I just want him to distinguish between the administrative scheme and the principle of addressing the on-the-runs issue, which was a matter of public record at the time. Q1717 Ian Paisley: But the issue that I think people will find hard to believe is that individual names were not brought to a Minister’s attention, given how serious the issues were under discussion and given that this scheme started with an individual’s name. Their name is largely irrelevant as far as you’re concerned because it wasn’t during your tenure, but during your tenure—indeed, on your last day in office—this name, John Downey, appeared in the list. Mr Hain: In what form? Where did it appear? It was never shown to me. Q1718 Ian Paisley: Okay. You have made that clear. It was never shown to you, but there is some evidence to show that you had received letters in 2006 about John Downey, signed off by your Attorney-General, your colleague in the Cabinet? Q1719 Ian Paisley: Do you want to see a copy of the letter? Mr Hain: I’m not doubting that you have something in front of you. Are you then saying that on the final day of my office, a letter was sent to me again? Q1720 Ian Paisley: No, I am saying that the decision to include John Downey was made on the last day of your office. Mr Hain: As I said, the decision to include John Downey was nothing to do with me. That was a matter for PSNI officials, PSNI officers, for the law officers and finally for the Northern Ireland Office officials. It would have been—and I repeat, Ian—absolutely improper for me to have got involved in the assessment of who did or did not receive those letters. Q1721 Ian Paisley: I know. That would not be the accusation. You wrote in The Guardian a couple of weeks after the whole issue of the John Downey case emerged that Northern Ireland is light years ahead of where it was. I think that is absolutely true. You make some assessments then about how things have moved on. In your autobiography you claim that when you were a young man in the 1970s in Derry, and I am quoting, you “jumped into a car with couple of young provos”—Provisional IRA members—and drove off with them for a chat. In another section you go on to say that, “My anti-colonial upbringing made me sympathetic to the political aims of Irish republicanism, but not to the violent methods.” You detail a particular perspective and point of view of your opinions—that you were, I suppose, sympathetic to the republican ideology. I am looking across the Gallery today and I see victims from Hyde park, from Birmingham, from Enniskillen, from Harrods and from other locations. Victims that we have spoken to in this Committee say that they feel really gutted that people in authority, people like you, suggest to them that they should be grateful to you for this process because of what has actually emerged. Do you get a sense—I know you have taken on views of victims in the past from my own dealings with you—of how bitter and how angry the victim community, and I call them a community, feel whenever they know that they are being told by people like you to be grateful for this? Mr Hain: I am not asking anybody to be grateful. I am simply pointing out, as you just acknowledged a few minutes ago, that Northern Ireland is light years away from the evil, the horror, the 3,000 deaths in some atrocious terrorist outrages and all the victims that have suffered as a result. Northern Ireland is light years away from that horror and evil. One of my purposes, one of my main missions as Secretary of State, and something that in large part I think was achieved, was to get an end to that horror so that there would be no more new victims in the future. As regards my memoirs and so on, yes, on that visit I met Unionists, I met all sorts of people, and I found myself in the particular situation that I have honestly described. I think you will know personally, Ian—and certainly your father will confirm—that in my dealings with you, in my dealings with everybody else in Northern Ireland, nobody could accuse me of being prejudiced in one way or the other. I could not have actually undertaken that task unless I had done so with respect for everybody. Something else I said in those memoirs was that, as Secretary of State, I accorded the DUP, and particularly its leadership, more respect than arguably it had ever before been accorded, because your father in particular and all the DUP’s leadership were entitled to that, having won the election in May 2005. We can go back over what we have or have not said, but I don’t accept that the way I stewarded that role and the way we brought it to a successful conclusion in 2007 was prejudiced by pre-Good Friday attitudes from before we got to the position that we did. Q1722 Ian Paisley: Just so you know, I haven’t accused you of prejudice; I haven’t made that accusation against the party. I am talking about the victims. This Committee is trying to centre its attention on the outcome, which has grievously affected victims on this mainland and across Northern Ireland and theRepublic of Ireland. Those victims feel that people such as you are saying to them, “Just be grateful”, which includes being grateful for a scheme that has let a person off the hook. Mr Hain: I don’t accept that at all. I’m not saying that people don’t feel that, partly because of the political spin that is being put on some of the things I have done and said. I do not mean to cast aspersions on any of my predecessors, but I don’t think anybody did more as Secretary of State to support victims than I did. As you know from direct personal experience, I appointed the interim Victims Commissioner in 2005 at the request of your father and the DUP. I thought it was an absolutely proper thing to do. Bertha McDougall, the person I appointed, was a fantastic interim Victims Commissioner and produced an excellent report. Q1723 Ian Paisley: But that was not a secret, invisible deal. It was made in public. Mr Hain: Although if you remember, Ian, I was accused by the SDLP, in particular, of doing a secret, shabby side deal with the DUP. Ian Paisley: But it was a public deal. You might have had a discussion and come to a conclusion, but it was a public appointment. It was public. Q1724 Ian Paisley: This thing that we are talking about—the on-the-runs—was private, secret and has only come out years later. There are letters here that show that you didn’t even know you were being written to about them. Mr Hain: You are actually, if I may say so, putting one and one together and making three. In the case of the administrative scheme, as I have already said in my opening statement, John Reid and then myself referred to what was going on at the time. In January 2009, Eames-Bradley reported that 200 cases had been dealt with in this way. If you are suggesting it was secret or invisible, why did the Ulster Unionist Assembly Member Basil McCrea tell “The World At One” a few months ago, in an interview that I listened to, that the Policing Board on which he represented his party, and on which every other party, including yours, was represented, was told about this? Q1725 Ian Paisley: Peter, I would not be hanging anything on Basil McCrea or his reputation, if I were you. I really would not be doing that. Mr Hain: Be that as it may, Denis Bradley, a respected former vice-chairman of the Policing Board, said the same thing. Chair: We did speak to them last week. Q1726 Lady Hermon: Peter—must I call you Mr Hain, or would you prefer Peter? Mr Hain: You don’t have to call me Mr Hain. Lady Hermon: Peter, could I ask you a series of questions? In the Downey judgment, you will know, because it is in the public domain, that the then Prime Minister wrote a confidential letter to the Sinn Fein president, Gerry Adams, shortly after Christmas—28 December, I think—in 2006. He said that he intended to expedite—that is Tony Blair’s word—the administrative scheme to deal with all the outstanding OTR cases before he left office. He obviously anticipated leaving early in 2007. We also know from the judgment that Operation Rapid—you told us that you didn’t know about its title—commenced in February. We know that the first meeting was on 7 February 2007. Could you explain the sequence of events? What would have happened to translate into practical effect Tony Blair’s confidential letter to the Sinn Fein leader? Who spoke to the PSNI? Who instigated Operation Rapid? Did you have a role in that, Peter? Mr Hain: Let me go back to 28 July 2005, when the IRA announced that it was ended its “war”, as it called it. In other words, it was laying down its arms and that was part of the peace process. When I responded to that, I said that the proposals that we—I think this is reported by Justice Sweeney in his judgment—had agreed and published in this document, “Proposals In Relation To On The Runs” in April 2003 would now be taken forward. I made a public statement to that effect. Q1727 Lady Hermon: Yes. The difficulty was, we know from the evidence that the administrative scheme commenced in 2000, three years before those proposals were published in 2003. Mr Hain: Yes, but the administrative scheme came into the second category under the generic title of on-the-runs. I will come directly to your questions because they are important and you deserve an answer to them. Lady Hermon: I do remember. Q1728 Lady Hermon: Yes, since 2000. Mr Hain: And continued before I became Secretary of State, after I became Secretary of State and under this Government was processing people, in the case at least of those 200-odd who got letters. Mr Hain: 228, who got letters. The scheme was processing people for whom, in those cases, there was no evidence or at least no evidence sufficient to bring a prosecution, and that is what the police and the law officers decided quite independently of any Secretary of State. Your specific question is at what point that process—that scheme—was accelerated. Q1730 Lady Hermon: My question is: how was the confidential letter between the Prime Minister of the day in late December 2006 put into practice within a matter of weeks by the PSNI—7 February 2007? How was it communicated to the Chief Constable? Did you speak to Hugh Orde directly as the Chief Constable? Mr Hain: I don’t recall speaking to him about it. Q1731 Lady Hermon: That doesn’t mean to say you didn’t. Q1732 Lady Hermon: We have a missing gap. We need to know the sequence of events. Mr Hain: I’ll tell you the sequence of events. I noticed that he said on the record that he didn’t discuss accelerating it with me. I did discuss accelerating it with my officials, and why did I? If you recall, at that time, we were entering a very sensitive period in the peace process. Key to this—Ian will recall this better than anybody around this table—was Ian Paisley Senior’s insistence, which I totally agree with, that he would not even entertain an agreement of the kind we subsequently achieved unless Sinn Fein signed up to support the principle of policing, the rule of law and the justice system in Northern Ireland. It was unthinkable to the DUP, particularly to its leader and, frankly, unthinkable to me—I agreed with him on this—that we could ever have achieved a satisfactory or durable deal unless Sinn Fein signed up to policing and the rule of law. Because of their history and their ideology, that was a very difficult thing for them to do. We don’t have to agree with them. Q1733 Lady Hermon: It was, of course, an extremely difficult thing for Sinn Fein to do. You have been very kind and generous in paying tribute, quite rightly, to Ian Paisley Senior, who was very courageous at the time he became First Minister in 2007. What is so upsetting when you read the Downeyjudgment is that, behind his back and under the Prime Minister of the day, Tony Blair, and the Secretary of State, these OTR letters were going out secretly. That is what is so deeply upsetting. Mr Hain: Let me come back to the secrecy issue and let me then deal with the particular sequence that you are properly probing for. In the course of trying to get Sinn Fein and the Sinn Fein leaders, in particular Gerry Adams and Martin McGuinness, with whom I was negotiating as I was with Ian Paisley senior and his colleagues on an almost daily basis, to move things forward, this was a critical period. It was very important for the Sinn Fein leadership in order to get their followers, many of whom were still very reluctant to sign up to policing and the rule of law. It was a very big historic step to make; do not underestimate how big an event that was for them. Q1734 Lady Hermon: So are you suggesting that the OTR letters were a trade-off to get Sinn Fein to join the Policing Board? Mr Hain: No, I am not suggesting that at all. Q1735 Lady Hermon: That seems to be your line of argument. Mr Hain: You can make what line of argument you want to. I am simply explaining the historic sequence of events here. Gerry Adams made it clear to me that getting processed these questions of those who could and were eligible to be processed under the administrative scheme as quickly as possible was a very important part of getting his followers signed up to the principle, which they ultimately signed up to in a series of conferences in the period January to February, I think, 2007, to this historic change for Sinn Fein and Republicans in general. If you are asking me if I encouraged, through my officials, the scheme to be accelerated, I assume by extra resources, in fact only 12 cases, I am informed, of letters went out under my watch as Secretary of State. Only 12 out of 200-odd, but that is not material to the point I am making. Q1736 Lady Hermon: So you are saying to us that Northern Ireland Office officials took forward a Government policy to expedite these OTR comfort letters, this administrative scheme. What on earth happened to operational independence of the Police Service of Northern Ireland? Mr Hain: But there was no interference in the independence. It was simply a question, as I understand it, though I don’t know for a fact, that more resources were then put in to making sure this was addressed. Why? Q1737 Chair: Can I ask what were those resources? Who got those resources and where did they go? Mr Hain: I assume there was redeployment. You will have to ask. Q1738 Chair: In the police? Mr Hain: Yes, absolutely. I assume. They were the key agents here. Q1739 Chair: I just wanted to know. Mr Hain: Indeed. Why was this crucial? I make no apology for making that representation. This was not to cut corners or somehow to produce a situation that did not fit the Attorney-General’s description of this administrative scheme as being absolutely lawful. It was in order to ensure in this narrow timeframe that we had to try to get this deal done that there was momentum in the process. That is all it was. Q1740 Lady Hermon: So Northern Ireland Office officials put pressure on the PSNI. Mr Hain: I do not accept that the Northern Ireland Office put pressure on anybody. The Chief Constable of the PSNI, Sir Hugh Orde, is incapable of having pressure put on him by politicians or officials acting on their behalf. He never, to my knowledge and what I can recall of the evidence that he has given you, responded to political pressure. That would have been wrong of him. Q1741 Lady Hermon: So Operation Rapid just happened to come into effect on 7 February 2007. Mr Hain: No. I am not pretending, and there is nothing wrong with it, Sylvia. I said to officials that to ensure that we can get Sinn Fein across the line to support the principle of the rule of law and justice and policing—which you support and I hope we all do and is critical to the peace process—of course this process had to be accelerated. There is nothing reprehensible or wrong about that at all. Q1742 Lady Hermon: What is wrong with it in my view is that I am looking at the dates of two written replies to myself, the hon. Lady for North Down, from you as Secretary of State for Northern Ireland. The first of them happens to be dated 7 February 2007, which happens to be the date that Operation Rapid commenced. I had asked what the Government intended to bring forward if, in fact, it was not legislation or an amnesty. Your reply, and opening statement, made reference to it. You said that this was far from being an invisible scheme; you said that your predecessor John Reid had referred to it in his reply on 1 July 2002. Q1743 Lady Hermon: Let me just read, for the benefit of those in the Committee and in the public gallery, the reply that was given to Parliament by the then Secretary of State John Reid and repeated in your reply in 2007 to me: “All ‘on the run’ cases continue to be subject to the normal criminal justice process.” What on earth is normal about secret letters being signed off by Jonathan Powell in No. 10? What was normal about that, Peter? I then went on to say—I am reading out from the answer that you have in front of you, which you received at the time—“All ‘on the run’ cases continue to be subject to the normal criminal justice process”, as indeed they did. “I refer the hon. Lady to the answer given by my predecessor, the right hon. Member for Airdrie and Shotts (John Reid) on 1 July 2002, in which he said: ‘We are still considering how best to implement the proposals which we and the Irish Government made in relation to this following the Weston Park talks. In the meantime’”—this is important, said on the record to you and to Parliament—“‘any inquiries received in relation to individuals wishing to establish whether they are wanted in Northern Ireland in relation to suspected terrorist activities have been communicated to the Attorney General, who has referred them to the prosecuting authorities and the police.’” That was the administrative scheme. John Reid told Parliament about it on 1 July 2002. I repeated it to you on 7 February 2007. Q1744 Lady Hermon: Yes. In your opening statement, you actually said that the function was in the title: administrative. Q1745 Lady Hermon: Where precisely do the words “administrative scheme” appear in the written reply to me, or indeed the one the following month? Mr Hain: But Sylvia, the fact that it does not apply—how can anybody read those words that you have in front of you, and which I have just read out to the Committee on the record, other than that the process that happened under the administrative scheme of inquiries being received by the PSNI and the law officers being investigated and so on? That was what it was. Q1746 Lady Hermon: You, very kindly, have read into the record the written reply that you gave to Parliament, saying that “all ‘on the run’ cases continue to be subject to the normal criminal justice process.” I asked you what was normal about Jonathan Powell. Those are the written replies. There was another one, when you told me that, in fact, the Government were not planning anything; that was the following month. How can you reconcile that, Peter, with the evidence that you gave in your sworn affidavit to the Downey case, to Mr Justice Sweeney? I am just quoting here, from your signed affidavit: “The procedure was in a number of ways wholly unprecedented.” Unprecedented—it wasn’t the normal criminal process. Mr Hain: These were not normal times, Sylvia. Q1747 Lady Hermon: Oh, sorry, Peter. Please don’t interrupt me, just for one moment. You said, in your sworn affidavit: “There were a number of exceptional features to the scheme. The first, of course, involved Sinn Fein being formally put on notice… The second was that the scheme progressed in a non public manner”—your words, not mine. You also said: “Confidentiality was maintained for the individuals who submitted their names” via Sinn Fein. Mr Hain: Of course it was. Q1748 Lady Hermon: So how do you reconcile this exceptional unprecedented scheme, which you referred to, but only in your affidavit to Mr Justice Sweeney and the Downey case, with your written replies telling Parliament that all OTRs went through the normal process? Mr Hain: To me, they are one in the same, and it ought to be evident to everybody on the Committee as well. Why? Because it is one thing to say, as I accurately described to Justice Sweeney—why would I do anything else?—an individual comes to the PSNI and says, “Am I wanted for something?” and the PSNI, under the procedure—by the way, this could apply to any crime anywhere in the UK, but in this case it was in Northern Ireland in those exceptional circumstances and, in that sense, was unprecedented—does an inquiry and an assessment takes place, and if they are wanted, that’s that. If they were not wanted, they got the letter, which you all know about. This could not be emblazoned, and nor should it have been, or put on “Good Morning Ulster” or some kind of public, transparent thing. This was dealt with in the criminal justice process—as the Attorney-General has confirmed, absolutely lawfully and properly—as a matter of confidentiality between the individual citizen, the PSNI, the law officers and the Northern Ireland official who, in the cases we know about, wrote that letter. Of course. Q1749 Lady Hermon: Yes, and they got letters signed off by the chief negotiator in the peace process, by the Prime Minister’s chief of staff. That, you are telling us, is part of the normal criminal process? Q1750 Lady Hermon: These letters were signed by Jonathan Powell at the beginning and then signed by Northern Ireland Office officials. Q1751 Lady Hermon: With the greatest respect, at the beginning of your evidence, in response to my colleague Mr Paisley, you referred to Norman Baxter’s evidence and said that in fact an inexplicable error had been made by the PSNI, by Mr Baxter. The error was actually made by the Northern Ireland Office contacting the PSNI headquarters but never explaining that they were going to alter the letter that had been issued by the PSNI. The error is wholly the responsibility of the Northern Ireland Office never letting on they were changing the words of the letter. Mr Hain: Well, with all due respect, I take the question of ministerial responsibility very seriously, the principle of ministerial responsibility. Therefore, Northern Ireland Office officials, when I was Secretary of State, were my officials. I didn’t actually know anything about this and I don’t know at what point—whether I was still Secretary of State—when those particular checks were being made, even though John Downey received the letter a month afterwards, I think, on 30 July, if I am not mistaken. Q1752 Lady Hermon: It was 20 July. Q1753 Lady Hermon: We intend to ask the official himself since he is named in the judgment, with the greatest respect, Peter. Mr Hain: Indeed. By the way, he is one of the finest officials I worked with. I simply note from Chief Constable Hugh Orde’s evidence that he says he cannot understand why Mr Baxter did not tell his superiors. That seems to me to be the key to the issue. As I understand it, and I stand open to correction on this, the key Northern Ireland official involved was actually quite concerned, because in the back of his memory—as I understand it—John Downey’s name had cropped up as being on a Metropolitan police computer. I may be wrong about that, but that is what I understand. Therefore, if there was a fault in this, I do not think it can be seriously and fairly laid at the hands of Northern Ireland Office officials, but you will make your own judgment about that. Lady Hermon: I think we will. Mr Hain: As for Jonathan Powell, he will have to explain himself as to why he signed letters or not. I was nowhere near that. Lady Hermon: He will, I am sure. Q1754 Chair: Thank you very much. You have made a lot about getting Sinn Fein across the line, I think you said, to accept policing and justice. One of the difficulties we are having is understanding why letters to innocent people will get anybody a deal. Mr Hain: Do we know that anybody received a letter, other than John Downey, who it is alleged was not innocent? Q1755 Chair: I am referring to innocent people. What we are struggling with is understanding why that would get a deal. Mr Hain: Sorry. I misunderstood. Q1756 Chair: Why would writing letters to people who are not suspected of anything, whom there is no evidence against, get the kind of deal you are saying was so incredibly difficult—indeed it was—to get? The two don’t match. Mr Hain: I think they match absolutely. Q1757 Chair: Writing letters to people who are not wanted? Mr Hain: If somebody was concerned as to whether they were wanted or not—remember, in my opening statement, I was very careful to say that whether or not they had been involved in troubles-related activities—I make no judgment on that; I am not in a position to do so, nor are any of us, and I am in danger of repeating myself, but it sounds as if it is necessary—in the case of those against whom there was no evidence that the police felt was sufficient to bring a prosecution for incidents that were committed maybe 30, 40 or even many more years before—this is the whole problem haunting Northern Ireland from the past, and still does, which leaves victims in an impossible limbo and the suffering that they have to endure—it was very important for somebody who had to sign up to the peace process, when, in this instance and in that period, when I was working very hard with some of you round this table to get the peace process we ultimately did, to feel they were part of a movement into a new future where we could put the horror and evil of the past. That did not mean cutting corners; it was done absolutely lawfully and properly, but it was essential for Sinn Fein to have that reassurance. Sinn Fein members and their followers and republicans had been involved over many years in all sorts of activities which we would all condemn. Since the time when this was all happening in 2006-07, they have been in a period with an entirely new future. It was as if a peace process wasn’t happening. I was involved in very, very difficult negotiations to achieve what we ultimately achieved—an end to the horror. Q1758 Jack Lopresti: Mr Hain, you started in your statement by referring to a fundamental misunderstanding of the facts as you see them. Are you surprised at the public reaction? Obviously, now that this has come to light it has been debated in Parliament and we are having this inquiry. If it is so straightforward, what did you think when the outcry occurred? Mr Hain: I understood the outcry, especially on the part of victims. This was a complete fiasco, and worse than that. I totally understand that, but I also think—there may be a reaction from some members of the Committee when I say this, but I strongly feel it—that when people use phrases like “getting away with murder”, “amnesties” and “get out of jail free cards” in respect of the administrative scheme when this was never the case, it does cause pain and hurt to victims. And I think that politicians who try to score political points using the grief of victims do victims no service at all. Our intention collectively, my intention and everything I did when I was Secretary of State was to ensure that there were no victims in the future and, in addition, in the ways I have described, to try to get the past addressed, which Northern Ireland politicians have so far been incapable of doing, but they should do as it is their duty. Q1759 Jack Lopresti: But is there anything else that we are not aware of and is not in the public domain that relates to the Unionist or loyalist communities that may cause an outcry if it ever were to come to light? Q1760 Jack Lopresti: Well, there wouldn’t have been a similar process because we are dealing with on-the-runs, but, as far as the peace process and your negotiations when you were Secretary of State are concerned, is there anything yet to come to light, dealing with the Unionist community, which could, in your opinion, cause a similar outcry? Mr Hain: I am not quite sure what you are getting at, although I have a good idea what it might be. Jack Lopresti: It is a genuine question. Q1761 Jack Lopresti: I am trying to get some balance and help you out here. Mr Hain: Yes. Let me give a very good example of what I did with the loyalist community, which had been wholly unprecedented and was criticised by Unionists in the main, actually, and not the SDLP or Sinn Fein as far as I recall. I actually sought to engage in that important period of 2006-07 with loyalist leaders, many of whom were involved in criminality: Ulster Defence Association figures and so on. Some of them were described by one of my officials euphemistically as “men in uniform”. I met them, and that was unprecedented for a Secretary of State to do. I met them to try and bring them into a political process, as had happened to republican leaders, in order to make progress. Actually, I think the failure to do that since, particularly, if I may say so, in the last few years, has helped to create a sense of exclusion by the loyalist community and their leaders; hence the unrest that we have seen. I am not excusing it or supporting it; I am simply explaining it. So, yes, I engaged with the loyalist community, including “men in uniform” who had never been engaged before, and that helped their community to get into a better place in that period. I am afraid it has slipped back since then. There is one other thing that I should say in that respect. Ian will know about this. I referred briefly to it, so I will only refer briefly to it now. I appointed the interim Victims’ Commissioner in 2005 as a result of a request from the DUP. I make no apology for it. It was the right thing to do. We needed that job done by as fine a citizen as Bertha McDougall proved to be. That was denounced at the time as shabby and furtive, a side deal and all of that. It is as if people do not understand how you get a political process and a peace process on the road, keep it on the road, and get the deal you need at the end. You cannot do it in a television studio. Q1762 Lady Hermon: I am sorry, Peter, to interrupt. There is absolutely no comparison between an agreement to appoint an interim Victims’ Commissioner and the OTR scheme. Chair: Let us have everybody in order. Everybody will get in. Q1763 Naomi Long: Peter, may I correct a couple of things that you said in your evidence? First, not all parties were on the Policing Board in the period to which you refer. My own party, for example, had no representation on the Policing Board until 2011, so I want to correct that for the record. Also, in the Policing Board’s evidence last week, they actually contested the view stated by Denis Bradley that the Policing Board had been briefed about this. They said he may personally have been briefed about it, but they took issue with the notion that the Policing Board had been briefed. Indeed, I think his deputy, or at least another member of the Policing Board who is currently the deputy chair, said that he was on the board at the time and was not briefed about the issue, so I think that also needs to be corrected. Mr Hain: Well, that is his view. I am not saying he is right or wrong, but Denis Bradley is somebody we all have considerable respect for. Q1764 Naomi Long: I think the process at the time was quite different in that sometimes the chair and the deputy chair were briefed singularly, as opposed to briefed with the whole of the Policing Board, so we need to be careful in extending that, from saying the chair and deputy chair were briefed to saying the Policing Board were briefed. That is quite an important distinction. I want to ask whether you can clarify what exactly you mean by the OTR issue being an anomaly. Mr Hain: If you remember, it was incredibly difficult—as I am sure it was for people like you as well, Naomi, quite understandably—when 400 loyalist and republican prisoners were released after the Good Friday Agreement, as part of that agreement, some of whom had committed awful atrocities: the so-called Shankill butcher, for example, Sean Kelly, being just one instance. There were awful atrocities in the troubles. That caused deep, deep pain to victims, but it was an issue that was necessary to get the Good Friday Agreement and to get us to the point 10 years later where we got the settlement that we ultimately did. But it left the anomaly of people who have not yet been prosecuted, who wondered if they might be prosecuted. That was the anomaly described in the proposals that I have here, which you are probably familiar with, and which were published in April 2003. That was why it was called an anomaly. Q1765 Naomi Long: I do not understand how that is an anomaly. The Good Friday Agreement was very clear that those who had been convicted would be released early, and that was endorsed by the referendum on the Good Friday Agreement. It was publicly acknowledged that that was part of the package that would go through, which sets it apart from this scheme, which was never publicly endorsed. So I think the comparison is flawed. How is it an anomaly? If someone, for example, is not guilty of a crime, but suspects that the police may wish to question them in connection with the crime, how does that make them an anomaly? Any citizen could be in that situation. They are not an anomaly. They are simply somebody who has not been convicted and whom the police may wish to question. Mr Hain: I understand that and I accept that. The anomaly is the first category that I described in my opening statement. That is to say people who were wanted. I think some of them may have been escapees. Some of them may well have been. They were wanted and the police were pursuing them if they could get them within UK jurisdiction and would have brought them to court. It was an anomaly in the sense that those people, in a period where the troubles had long gone, in which 400 prisoners on both sides of this particular divide—republicans and loyalists—had been released and the anomaly was that those who were still wanted were unable to join in the peace process in Northern Ireland, if I could put it that way, because they could still be prosecuted. So, under the Northern Ireland (Offences) Bill, a special judicial process was established, the elements of which were first published in April 2003 and to which we were committed as a Government, to address that anomaly. But it involved people coming to a special judicial tribunal in front of a judge as you remember from that Bill. It was highly controversial, but necessary, to deal with those people and to make them feel part of the process as well and have a stake in it. That was the anomaly that needed to be addressed and still hasn’t been addressed, by the way. Q1766 Naomi Long: And yet the peace process continues. Q1768 Naomi Long: Which is that those who were guilty of something and, for example, had escaped from jail had not benefited from the early release scheme and that, without that, the peace process would have foundered. How does that add up? Mr Hain: It adds up in this way precisely. We brought in, to honour our obligations under the peace process, published as part of an agreement—like it or not—finally after the Hillsborough talks in April 2003, legislation. I brought in legislation after the IRA announced the end of its war in July 2005. I publicly said I was doing this. I introduced the Northern Ireland (Offences) Bill. That was designed to address the anomaly. Sinn Fein then withdrew their support for the Bill when they realised—I think they probably knew all along, but you will have to ask them—that it applied to British soldiers as well. The SDLP was particularly critical of that. The Bill was published. It went through its Second Reading. It went through all its Committee stages in the House and then Sinn Fein said, “We no longer think you should take this forward.” Well, we were only doing it as part of our obligations under the peace process to address the anomaly. Sinn Fein prevented us from addressing the anomaly, if I can put it that way. So they had no cause to depart from the peace process or pull the rug from underneath it. Just as it was the initial DUP position that they wanted a period of a year or two to test—for understandable reasons, given their history—whether Sinn Fein’s support and conversion to support policing and the rule of law was for real. Ian Paisley Senior, I think I am right in saying, said to me that he would like to see a period of working in practice to be sure that there would be no return to the past. I understood why he was saying that. In fact, that never happened. Sinn Fein signed up in the early spring of 2007 and the elements of the final historic settlement were negotiated in March 2007 and devolution happened on 7 May 2007. So neither side gets everything that it wants, but it gets momentum in that direction. Q1769 Naomi Long: Clearly, you would argue that the administrative scheme did not address that anomaly. You said that it remains unaddressed. Q1770 Naomi Long: I would argue that it is not an anomaly and that due process of law would take care of that issue. There is another anomaly, if you want to describe it as that: did you ever think that you had an obligation—I think that was the word you used—to deal with those who were exiled by paramilitaries during the troubles? When you were discussing the issue of those who were on the run, by choice, did you at any time feel any obligation to address those who had been exiled from Northern Ireland by paramilitary organisations and were unable to return? Mr Hain: When you say I had any obligation, could you spell that out precisely—I am trying to help you on this. Q1771 Naomi Long: You said that, as part of the peace process, you had an obligation to deal with the anomaly of the OTRs. But there is another group of people who are unable to return to Northern Ireland because of paramilitary threats that have been issued against them that were never withdrawn and have never been withdrawn. Mr Hain: On all sides. Naomi Long: Yes. Did you ever feel that that was as important as dealing with, for example, the on-the-runs issue, in terms of being able to cement the peace process and allow people to return to a more normal society? Q1772 Naomi Long: Well, they still are being exiled, with due respect. Mr Hain: But I mean new people being exiled. Mr Hain: What, by CIRA or RIRA? Naomi Long: No, they are still being exiled, for example, by loyalist paramilitaries. That still happens. Mr Hain: Oh, right, well that is totally wrong, Naomi. It’s totally wrong. Mr Hain: In the context of a peace process. Naomi Long: In any context. Q1774 Naomi Long: That was the context in which it was done, yet those who were forcibly made to leave Northern Ireland were not afforded the same opportunity to return, or were not given the same priority. Would you accept that that is accurate? Mr Hain: What I would accept as a description of what happened, which I make no apologies for, is that in order to get the peace process established and locked in, we had to address this anomaly, which was very important for republicans. Q1775 Naomi Long: But you didn’t. You didn’t address the anomaly—you have just said you didn’t. Mr Hain: Well, we tried to. Naomi Long: Yes, but you didn’t address the anomaly. Mr Hain: But we tried to. We honourably tried to. I did more than anybody else—I introduced a Bill that, frankly, wasn’t an easy Bill to introduce. When I had to withdraw it, frankly, I was glad to see the back of the Northern Ireland (Offences) Bill. It wasn’t easy, as all of those who were present in Parliament at the time will recall. You will recall, Chairman, that you were very critical of it, and I understand why. I would come back to my central point. It is as if conflict resolution—in this case, a conflict going back centuries that had gone through the most murderous troubles in living memory, which affected Great Britain as well as Northern Ireland—could be done in some kind of ivory tower, as if it was a normal society. This was an abnormal society; it still is to some extent, as you know—you have been a victim yourself. Q1776 Naomi Long: And I certainly don’t need convincing of that. However, I would argue very strongly, as I did at the time and have done consistently, that in order to create a peace that is fair and stable, you also need to instil some sense of the rule of law and justice in the process of peace. Mr Hain: Absolutely. That’s what we did. Q1777 Naomi Long: I would say that that is not the perception of many of those who were directly affected by the decisions that were made, particularly on the issue of the on-the-runs. Mr Hain: Well, if I may say so, I think it is the duty of politicians like you to point out that the rule of law now applies in Northern Ireland as a result of the settlement that we got and that I personally negotiated. It now applies in Northern Ireland, and I think you should be pointing that out to everybody. Q1778 Naomi Long: With all due respect, I am well aware of my duties as a public representative, and I certainly don’t need to be told them in the Committee. I have another question. In the reply to Lady Sylvia, which you read out in detail, could you just point out for us where you mentioned letters being sent to those who were on the run? Mr Hain: I never said that I said letters were sent. Q1779 Naomi Long: No, so that was never disclosed to Parliament—that letters were sent. Mr Hain: No, why should it have been? Q1780 Naomi Long: Well, because it is an important part of the administrative scheme. In fact, it is the part of the administrative scheme that led to the fall of the John Downey prosecution, so I think it would be fair to say that it is an important aspect of the scheme. Mr Hain: No, no, no. I need to correct you here. The part of the administrative scheme that failed in the John Downey case was the inexplicable failure of people to absorb the fact that, apparently, Downey’s name was on the Metropolitan police computer. Q1781 Chair: That’s not a legal point. That’s not why the case fell at all. Mr Hain: If the procedure had been followed properly, John Downey should never have received that letter. Q1782 Naomi Long: But John Downey did receive the letter, so the letter is material to the fact that he was not able to be prosecuted. Q1783 Naomi Long: The letters being issued, the manner in which they were issued, the content of the letters and the accuracy of the letters are absolutely fundamental, yet at no point did you feel it necessary, despite close questioning, to mention that there were letters, because you saw those as unimportant. Mr Hain: No, it is not that I saw them as unimportant at all. Q1784 Naomi Long: Why did you not then mention the letters? Lady Hermon: Why did you not expose them in a number of written parliamentary replies? Mr Hain: Because it was very clear that there was an administrative scheme going on. You were told that, and John Reid was told that. Lady Hermon: I was not. Q1785 Chair: Order. The problem is that while everyone knew about the on-the-runs—that was widely discussed—I do not think that we accept that everyone knew about a specific scheme. That is the point. Mr Hain: But when you answer a question and explain the process that came under the umbrella of what we now call the administrative scheme—I am not sure that it was called that at the time I was serving as Secretary of State, but that is neither here nor there. I told Parliament and I told Lady Hermon. John Reid told Parliament in July 2002 that people who wanted to know their status in these matters could inquire of the police and be assessed. Chair: It is in itself legally questionable whether the letter would still apply, but we may get on to that. There will be a vote at 4 o’clock, and I will not run this session beyond that, because we have another to come, so I plead for brevity among Members. Q1786 Naomi Long: It is important to this issue. The issue of the letters, when you described the scheme, was not raised. The process for the sign-off of the letters and the checking of the letters—none of that was discussed in any of the parliamentary answers that were given. Yet the letters are important, because it was the letters that the individuals wanted, so that they felt some security, despite the fact that Barra McGrory, in his evidence to the Committee, said that he felt that, on balance, the letters were really worthless, because they only pertained to the day in question and no more than that. That is his view as a prosecutor. Naomi Long: However, obviously that has not been the case with the John Downey issue, because of the abuse of process. I want to ask you two specific questions. You have spoken about who you believed knew about the scheme. Did you make people specifically aware that there was such a scheme so that those from any background or any part of the community who may have been concerned that they were wanted for questioning over a crime would be able to avail themselves of that scheme, so that it was open, transparent, fair and accessible to everyone? Did you do that at any point? Mr Hain: Can I just take you back to this time? Naomi Long: No. I would like you to answer the specific question. Mr Hain: I am going to answer the question. I always answer the question, as you know very well, Naomi. Let me take you back to this time. This was a period of intense negotiation to resolve an historic conflict. Everything I did was lawful. Everything I did was honourable. Everything I did I stand by and am proud. There might have been mistakes; we all make mistakes, but in the broad swing of things, and in this territory, as well, I am proud of what I did and I make no apology for it. Northern Ireland has now enjoyed seven years of peace and stability, because of the success of those negotiations. It involved individual negotiations—side deals, if you like—with the DUP and with Sinn Fein in the main, because they were the key parties. The SDLP had shown great courage many years before, as had the Ulster Unionist party, in starting this process. At the time, the key parties to get across the line to get the deal done were Sinn Fein and the DUP. Yes, I negotiated in private with them and yes, I did deals with them. I make absolutely no apology for that at all, for otherwise we would not have got the settlement that we did and that we have seen the fruits of over seven years. In that context, did I tell every other party, whether it was theAlliance party or any other party, everything that I was discussing with every other party? No, I did not. Naomi Long: That was not the question that I asked, with due respect. Mr Hain: Well actually, I think it was. Q1787 Naomi Long: No, it was not. The question is very clear, and if we could have an answer to that one question, it would be helpful. Did you make other people aware and advertise, if you like, the availability of the scheme to people from right across the community, so that anyone who wished to check whether or not they were wanted for crimes pre-1998 was able to avail themselves of the scheme? It is a simple question; it is a yes or a no. Mr Hain: Anybody could have come to the PSNI and asked whether they were still wanted. Anybody could have done that. Naomi Long: Again, that is not the question. Mr Hain: Anybody could have done that. Naomi Long: The question is: did you make people aware that the scheme existed? It is a simple question. Mr Hain: I did not go out broadcasting to all and sundry that there was a process that is normal under the criminal justice process where citizens can come and say, “Am I wanted or not?” I make no apology. Q1788 Naomi Long: My final question, you have said repeatedly throughout today that you make no apologies. We took evidence last week from victims’ organisations who described, not their anger with politicians, not even their anger in fact with those who sought the scheme, but their anger with Government, who they said they felt had betrayed them. That was the word they used: they felt that they had been betrayed. Did you at any time feel that victims ought to know what was happening? They did know about the early prisoner release scheme, so they were fully aware of that and were able to make their views known on that through the referendum and otherwise. If you don’t feel you need to apologise for it, did you at any point feel from a moral point of view that the victims should know what was happening in this process, which could affect cases that related very specifically to them and to their loved ones who had died during the troubles? Mr Hain: I understand that, but I would just say this: there will never be a way of dealing with the past that will satisfy everybody. It is very, very difficult, particularly when you have been a victim. In the Hyde Park case, one of the worst terrorist outrages of the entire period, of course if I was a relative of one of the dead soldiers on that occasion I would feel deeply, deeply angry and still bitter about it and that people have not been brought to justice—of course I would. Q1789 Naomi Long: The issue that they feel bitter about is the secrecy. They were very clear last week that the secrecy felt like a betrayal. They said that even if they disagreed with the scheme, that would have been different, because they could have at least made their views known, but the secrecy wounded them. I am asking a very direct question, because we are all aware of the context—it has been repeated numerous times. Did you at any point feel morally obliged to at least let the victims know about the processes in which you were engaged and your Government was engaged which could directly affect their families and prosecutions relating to those who died who were members of their families? Mr Hain: I understand exactly how victims felt—exactly how victims felt—and I still do. But I think it is really, really important here to understand that to get from where we were to where we are now involved taking very difficult decisions—extremely difficult decisions. The administrative scheme was part of that, and an attempt to address the OTRs was part of that as well. Chair: Thank you. I have got Oliver, Alasdair, Kate and Nigel. We have got to finish at 4 o’clock. Oliver Colvile: May I make a point, Mr Chairman? As we have to finish at 4 o’clock, I would be very grateful if Mr Hain might come back again. Mr Hain: I am at your disposal. Q1790 Oliver Colvile: Peter, thank you very much indeed for coming in. I have found our discussion this afternoon fascinating. I quote from your autobiography as well, which says that you were “…focusing on the big picture and learning the detail of the job rather than getting bogged down memorising the voluminous facts before me.” That suggests that perhaps you were not totally and utterly across the whole of the brief of what was going on. Would you like to comment on that? Mr Hain: No, I don’t accept that. Mr Hain: I would like you to read the full context of that. What I was saying is that when you are a Secretary of State, you focus on the—of course you are across the detail. You get a red box at night and it is absolutely full, but in that red box are matters of routine and then there are matters of key, crucial importance, which in this case were mainly to do with the peace process and the political process. You turn that inside out and upside down. Q1791 Oliver Colvile: That is very helpful. So did you recognise that this was a very sensitive issue which you were trying to deal with? You did, didn’t you? Q1792 Oliver Colvile: Of course you did, and I most certainly would have done. So why didn’t you sign the letters? Mr Hain: Because I did not think it was proper. To be frank, it never arose that a politician, a Secretary of State, should insert him or herself into a legal criminal justice process. That would be completely abnormal. Q1793 Oliver Colvile: So you did know that those letters were going out, did you? Mr Hain: I didn’t know that a particular letter was going out at a particular time. To be perfectly frank, the first time I saw a letter was during theDowney case, and that is completely proper. If I had known who was being processed and what the assessment was, I would have been dragged into an assessment that was being made by the police, the law officers and the Northern Ireland officials involved at the end of that chain. Q1795 Oliver Colvile: Was when? Mr Hain: Was when I was told by the solicitor that the case was due to come to court, as I explained to Ian at the beginning. I didn’t know he had received a letter. I didn’t know anything about it. Q1797 Oliver Colvile: Yes, that’s when he was arrested. He was arrested on 19 May 2013—the reason I know that is because it is my nephew’s birthday. It was an issue, therefore, that I remembered. Mr Hain: You can correct me if I am wrong, Oliver, but I don’t recall that being publicised at the time. Maybe it was. Q1798 Oliver Colvile: It was all over the national press. Oliver Colvile: Even I recognise that. Mr Hain: I remember when his solicitor came to see me, saying they had in mind a subpoena for me to appear and explain the procedures. I didn’t think that was the dignified way for a former Secretary of State to assist the court, which is what I did, by the way. I would like to have the opportunity to rebut the mendacious comments made about me by Mr Baxter, if I may, as I think your Clerk indicated. I was not really aware of the background to the Downeycase—remember, this was six years after I stepped down as Secretary of State—until his solicitor, Gareth Pierce, approached me and asked me to assist the court. Q1799 Oliver Colvile: I think that, if there had been a letter and I had had notice of it and if there was a lot of national publicity about it, I would probably have wanted to get to the bottom of it, just to satisfy my own curiosity. Mr Hain: Maybe, but remember that the letter, as we know, was sent after I left office, and I had not actually seen the letter until the solicitor gave me a copy to have a look at. Q1800 Oliver Colvile: During the course of the process when letters were going out, do you know whether anybody in the Northern Ireland Office started to take legal advice about what the implications of that were going to be? Mr Hain: I don’t know for a fact, but I can say that all the Northern Ireland officials were the very highest calibre officials I served with in my 12 years in Government, and the particular officials involved in this process were among the best of the lot. They would have done everything within the law—absolutely, totally within the law. There is no question about that in my mind. Q1801 Oliver Colvile: You were the Secretary of State and were reporting in to No. 10 Downing street. How much of a conversation did you have with Tony Blair to make sure he was aware of what was going on? Mr Hain: In what respect? He started the whole process off. Q1802 Oliver Colvile: I know, and you might have made sure you kept him in touch with what you were doing and what was happening in the Department, because it was a very sensitive time. Mr Hain: Of course I did. Q1803 Oliver Colvile: So would you have details of when those meetings or conversations might have taken place? Would you be willing to share that with us? Mr Hain: No doubt there might be details in No. 10’s records or the Northern Ireland Office’s records. No doubt there would be, because a note would have been made of my regular meetings with Tony Blair and conversations over the phone and so on. Particularly in this period—towards the end of 2006-07—we had a lot of contact, because he was naturally anxious to check that the momentum was in the process. Mr Hain: Twelve of them, I am told, under my watch. Oliver Colvile: We don’t know who those people are. Anything you can do to help us with that would be incredibly helpful. Mr Hain: I don’t know either, and I don’t think I can help you, frankly. Q1805 Oliver Colvile: But there are a number of victims and families of victims who now perceive, actually, that these letters have given them no way in which they can get justice for their families and for what happened. Mr Hain: I don’t agree with that. Q1806 Oliver Colvile: How do you think we can try to make sure that justice does take place? Mr Hain: I don’t agree with that assessment, because if for any case further evidence came to the PSNI’s notice sufficient to say that that letter is no longer operable, of course proceedings could follow. Q1807 Oliver Colvile: Did the letters continue after the legislation that you had tried to introduce had been withdrawn? Mr Hain: They were going on before, during, and after, including under your Government. Q1808 Oliver Colvile: I am fully aware of that. And nobody, at any stage of the game, said, “Actually, maybe we need to have a little think about this, as to whether we are going about this the right way”? Mr Hain: It was a normal criminal justice process. Q1809 Lady Hermon: It was not. Mr Hain: I am sorry, but let me quote what the Attorney-General told the House. He said that “the system of giving an assurance to an individual”—I am quoting directly—“that they are not wanted because they are indeed not wanted and there is no current basis for wanting them” was lawful. It was done, he said, “with the intention of taking the peace process forward, and done in a way that was not intended to prejudice, first, the rule of law and, secondly, the right of victims and relatives of victims to see justice be done”. That is the current Attorney-General. Chair: We will be discussing the matter with the Attorney-General. More evidence has come out since then, so he may want to revise his opinion, but maybe not. Q1810 Dr McDonnell: I don’t think anyone wants to take from the contribution you made to building and strengthening peace, but nevertheless, you do accept that there are serious concerns around this particular issue. Mr Hain: I understand that—and thank you. Q1811 Dr McDonnell: When did you know that letters were being sent in general, without being specific? When you went into the Secretary of State’s position? Did someone tell you at the very beginning? Mr Hain: When you are a new Secretary of State, you get a briefing, a dossier for the incoming Secretary of State, and you read through that, as indeed I did. The question of the on-the-runs was undoubtedly drawn to my attention, and the process that had gone back to 2001 to 2003. I do not actually recall the administrative scheme being mentioned specifically. Q1812 Dr McDonnell: The question I want to ask is very simple: who was running the scheme? Who was in charge? Q1813 Dr McDonnell: No, sorry. The PSNI were asked—this is clear from the evidence we received from them—for a specific piece of evidence; two dimensions, if you like. They gave that in two dimensions: at that date and time, and in the context of what they had. I would have accepted it if you were running the scheme, but the mystery and the scare for me is that there was somebody running loose somewhere, running this scheme behind your back. Mr Hain: I was not running the scheme. It would have been improper for a Secretary of State—a politician—to run part of the criminal justice system. It is wholly improper. It had to be run by the police, the law officers and, at the end of the line, the officials concerned who made the final assessment before they sent the letter out under their name. Chair: I am sorry to interrupt. There is a number of Members who have not been in yet who would like to get in. Would it be possible for you to come back after the vote? Mr Hain: Yes of course. Chair: Would that suit Members, to continue? Yes. I apologise for interrupting. Mr Hain: How do you mean embellished? Q1815 Dr McDonnell: Well, added to. Mr Hain: I don’t accept that. I don’t think Hugh Orde would agree with that. Q1816 Dr McDonnell: Certainly, that is the impression. Mr Hain: —dealt with in an abnormal context. Chair: Order. Can we have a question and then an answer? Q1817 Dr McDonnell: We received clear evidence here, I think from Peter Sheridan, that while opinions were sought, he was not aware that letters of the detail and the content that were issued were being issued,. Peter Sheridan was not aware of the level to which the scheme was taken. On behalf of the PSNI,he expressed an opinion as to the evidence against the individual, but the letters then moved on to a new, totally different level. That leads me to my next question. How was Norman Baxter supposed to correct mistakes in letters that he didn’t know anything about? The letters—he had no idea. He was asked for a simple opinion. That simple opinion was given, and yet somehow or other he did not know and he was not informed or kept informed that letters were being issued. How am I supposed to correct a letter that somebody else issues that I don’t know anything about? That for me is very simple. I will not and I can never accept that somehow or other the police had a hand, act or part in the scheme going wrong. Mr Hain: All I can do is observe the evidence given by Sir Hugh Orde. I have a great deal of respect for Peter Sheridan as well, who I worked with at the time. Since you mentioned Norman Baxter can I just take this opportunity, Mr Chairman, as you offered me to do, to say that he made what I believe is an extraordinary, inflammatory and libellous remark about me under evidence to this Committee? He said, and I quote, “It is not for me to judge Mr Hain, but in reading his statement to Mr Justice Sweeney, it is almost as if he displayed great glee in supporting a person who was suspected of murdering members of Her Majesty’s forces.” I take great offence at this. It is both pejorative and completely untrue. I displayed absolutely no glee in the written statement I made, nor was I “supporting a person who was suspected of murdering”. My sole intention was to clarify for the court the status of the letter, which was issued by the Northern Ireland Office, and the administrative scheme under which that occurred. Rather than appearing under subpoena, I was willing to assist the court in that way. I am formally asking the Committee to ask Mr Baxter to withdraw what I believe was a mendacious comment. Chair: The Committee has looked at this and considered your comments. We have not felt it necessary to ask Mr Baxter to withdraw what his feelings and his observations of the occasion were. We may discuss it further, but at this point we are not minded to ask Mr Baxter to withdraw anything. You have putyour comments on the record. Mr Hain: I have, and his were totally unacceptable. He may disagree with whatever he disagrees with, but he cannot attack me for doing something that I did not do, and I deeply resent it. Chair: He gave, I think it was qualified comments that he made, which were his opinion. I don’t think there was any accusation about wrongdoing involved. Mr Hain: Yes, but glee? There is nothing in my statement to the court that could be described as glee. Chair: I have allowed you to put on the record your feelings about what Mr Baxter said. A number of other people have objected to one or two things that Mr Baxter has said, and they are on the record as well. Mr Hain: Including the Chief Constable. Chair: I don’t want it to go any further at this point. Q1818 Dr McDonnell: Chair, one very quick point. I have to come in on this—I am sorry to have to come in on it—but there was a degree of sarcasm, to some extent, around your evidence or your comment on the appointment of the Victims’ Commissioner and that the SDLP referred to it as a grotty side deal. Q1819 Dr McDonnell: Was it not a side deal? Q1820 Dr McDonnell: It was a side deal. Q1821 Dr McDonnell: That’s all right, as long as we establish that. Mr Hain: I make no apology for it. It was part of getting the peace process over the line, Alasdair. I make no apology simply because not every party, including yours, was involved in every bit of the negotiation. It couldn’t be. You can’t build trust on any other basis. Mr Hain: Are you accusing me of being disingenuous or devious? Chair: Order. Can we have a question and an answer? Q1823 Dr McDonnell: The flipside of it is that you can’t build trust without being open and showing as much integrity as possible. The SDLP might very well have agreed, had you consulted them, to Bertha McDougall. Mr Hain: That may well be, instead of taking me to judicial review. But that the idea that it was disingenuous or devious, I cannot accept that. I appointed her in public. Her appointment was in public. The fact that I was then taken to judicial review, which was ultimately rejected, by the way, is another matter. Judicial review in Northern Ireland is politics by proxy in that kind of context. Now that we have got a more proper politics, the resort to judicial review is less frequent. Mr Hain: I am saying I don’t recall seeing it. Q1825 Kate Hoey: You don’t recall seeing it. But it would have been in your red box, as you talked about earlier. It is from the right hon. Lord Goldsmith, Attorney-General, and not many letters go from him. The public will genuinely not understand that, first, you don’t recall it, in relation to John Anthony Downey, when you said the first you had ever heard of him was when you got a subpoena. Mr Hain: Which is true. Q1826 Kate Hoey: That raises questions. You have gone on about how wonderful the NIO officials were. Yet all these NIO officials are copied in. Yet, just over a year later, on the last day of your being in office, which I accept may not be relevant as such, he gets this letter signed by the Northern Ireland Office. How can the Northern Ireland Office have signed a letter saying we have nothing on you, when less than a year ago this letter from our Attorney-General clearly says that Downey is wanted for arrest and questioning in respect of serious terrorist offences? Do you now accept that, rather than everybody trying to divert the blame to the PSNI, the blame, as some of my colleagues have said, fundamentally lies with the Northern Ireland Office? Mr Hain: —2007, after I had left office. Be that as it may, obviously, when this case was concluded and I saw that Justice Hallett was having her inquiry—I have seen her as well, and I knew you were having an inquiry—I talked to Northern Ireland Office officials. As part of that briefing, this letter was not mentioned to me. I received hundreds of letters as Secretary of State; you will appreciate that. What happens when you come to prepare for an inquiry of this kind is that you go to your old officials and seek a briefing. I was never able to keep any of the documents—I think Shaun Woodward made this point—and that is quite proper; it is Government practice. That letter was not mentioned to me. Q1827 Kate Hoey: But it was part of the Downey bumf to do with him. Q1828 Kate Hoey: Okay, but you don’t receive, it’s true, many from the Attorney-General. You didn’t receive many from the Attorney-General. Mr Hain: No. I received probably—I don’t know how many I received over the time I was Secretary of State. Q1829 Kate Hoey: Specifically in a letter, it talks about being prompted perhaps by the Northern Ireland (Offences) Bill, which you are clear you were very much involved with, or its withdrawal. “Some additional information was recently provided and the Director and police have recommenced their review. I write now with the results of seven cases.” No. 1: John Anthony Downey who is “wanted for arrest and questioning in respect of serious terrorist offences”. Do you accept that this is very, very serious? Something really serious went wrong in the Northern Ireland Office. Mr Hain: No, I don’t necessarily accept that something serious went wrong. As I recall, the leading official dealing with this told me in the briefing, which I had probably in early March, that he had double checked. You will have to ask him. Q1830 Kate Hoey: Which official was that? Mr Hain: This was Mark Sweeney. He said that he had double checked. Q1831 Kate Hoey: He is copied in on this too. Q1832 Kate Hoey: Who signed the letter to Mr Downey? You’ve seen it. Who signed the letter? Mr Hain: Mr Sweeney did. Mr Hain: Well, I don’t know about that. The law officers in the Attorney-General’s office were involved in that assessment. They were always involved in the assessment. So the very same Attorney-General whom you tell me wrote me that letter, his officials were involved in that assessment. Q1834 Kate Hoey: This is absolutely crucial, and what Ian Paisley brought up here is really important. It does look absolutely squarely that the Northern Ireland Office completely ignored a letter from the Attorney-General. Mr Hain: I can’t accept that. Q1835 Kate Hoey: Well, how come Mr Downey was then sent a letter? Mr Hain: You will have to ask him. Mr Hain: No, Mr Sweeney. Kate Hoey: Mr Downey will not be appearing here, I would imagine. Mr Hain: Kate, Mr Sweeney, who sent the letter, if you are going to call him, you will have to ask him that. Mr Hain: Indeed, and you may criticise me for that or not. But I am telling you honestly what my position is on that and my memory of it. Q1837 Kate Hoey: Can I move on? Did you ever attend any meetings or process or handle in any way matters relating to the royal prerogative of mercy? Kate Hoey: You were never involved with that. Mr Hain: When the news came out—in answer, I think, to your questions—it was complete news to me. Q1838 Kate Hoey: So you had never discussed the royal prerogative of mercy or using the word “pardons” with the Prime Minister or anyone else. Chair: Order. We will suspend the public session. We will come back at 4.26 pm. Thank you. Mr Hain: Yes, I do recall saying that under no circumstances would I consider a royal pardon, and he agreed with me. Q1840 Kate Hoey: Is that the only discussion that you recall on that? Mr Hain: Yes, because Sinn Fein were anxious to have this issue addressed. In a way, we could not do any more without the Northern Ireland (Offences) Bill. I made it clear that amnesties and royal pardons were never on my agenda and couldn’t be. I would never have considered it. Q1841 Kate Hoey: Were you surprised when you saw the very large number of people in Northern Ireland—admittedly an awful lot were before your time—who had been given them? Mr Hain: I was surprised in the sense that I did not know about it. As to the exact circumstances in which they were issued, whether it was under the last Conservative Government prior to us or some that were under us, I do not know the detail of it. Mr Hain: The issue would have been whether, given the withdrawal of the Bill that provided for a judicial process for resolving these cases where people were wanted by the police for crimes they had committed, you could have considered a royal pardon in their case. Well, you could have done, but I was not prepared to do so. Q1842 Kate Hoey: Okay. If we now go back to the previous question on the letter from Lord Goldsmith, in your evidence to the Downey court case you said, “I have been made aware that John Downey, an ‘On The Run’ applicant in July 2007 received a letter in the same terms as other persons at the same time.” Who made you aware of that? Q1843 Kate Hoey: When he first came to see you? Mr Hain: When she first came to see me—Gareth Peirce. Q1844 Kate Hoey: And then you said, “I have seen the letter, which in phraseology repeated in letters to many applicants previously”. Presumably Gareth Peirce told you that, too, because she had seen all the letters. Mr Hain: I don’t know. She must have done. Q1845 Kate Hoey: But you said, “I have seen the letter, which in phraseology repeated in letters to many applicants previously, provides an assurance”. Mr Hain: That is what she said, yes. Q1846 Kate Hoey: So had you seen all the other letters? It sounds like you did, given the way you talk. Mr Hain: No. That is not the inference I meant to be drawn from that. Q1847 Kate Hoey: “On its face it informed him that he was not wanted in the north of Ireland.” Did the letter refer to the north of Ireland or did it refer toNorthern Ireland? Because the north of Ireland is Donegal. Mr Hain: I always refer to Northern Ireland as Northern Ireland. Kate Hoey: I think you normally do; that is why I am surprised. Mr Hain: I was surprised to see it as well. It must have slipped through. Mr Hain: No. I signed the statement. I am not going to resile from it. Mr Hain: I haven’t, actually. Kate Hoey: Well, underneath all the officials in the Northern Ireland Office that were given, it says, “Reply for Secretary of State’s signature.” Are we assuming, then, that no reply was ever sent to the Attorney-General or, if it was, that you didn’t sign it, or just don’t recall it? Mr Hain: I don’t recall it. As I say, all I can say is that I received—this was an important one, I accept that—hundreds of letters; hundreds and hundreds of letters almost every week. Remember that I was dealing with not just the main central peace and political process but all the so-called devolved Departments, from Health to Agriculture. My junior ministerial team would normally have processed letters like that. Q1849 Kate Hoey: Remind me, who was your number two at the time? Mr Hain: My number two at the time in—what was the date of that letter? Kate Hoey: This was 2006. Mr Hain: That would probably have been Shaun Woodward. Shaun was the security Minister, so it would probably have been him. Shaun was reshuffled to another post in, I think, the summer of 2006—I cannot be absolutely certain—and Paul Goggins then took over as security Minister. Q1850 Kate Hoey: I am not questioning you saying that you don’t recall it or that you get lots of letters. I am questioning your confidence in the Northern Ireland Office and how wonderful they were, given that there were senior members of the Northern Ireland Office who got this letter, talking about Downey. How on earth, then, could a letter have gone out, signed by a Northern Ireland official? Kate Hoey: From Lord Goldsmith? Mr Hain: No, from Northern Ireland officials, including Mark, whom I think remains one of the very best officials. Kate Hoey: Okay, we’ve heard that. You’ve made your views clear about Northern Ireland officials. Mr Hain: He told me he remembers checking, because something was in his mind that Downey actually was wanted. He recalls checking; that’s what he told me. I didn’t know anything about this, but that is what he said to me in early March. If you are going to call him, I think you’ll find—I cannot speak for him—that he will confirm that he was troubled by the fact that it had come through the process, as these cases did, to him for a final check. He recalled, at the back of his mind—that is why he asked for it to be checked again. He asked, as I understand it, for the PSNI to check it again, or the Law Office to do so. He wasn’t simply willing to sign it off. That is what he indicated to me, but you will have to confirm that with him. Q1851 Kate Hoey: Obviously, if that is true, Lord Goldsmith had been very badly advised to write something, and yet it was with the result of seven cases, including John Downey. Mr Hain: You said the letter to me from Lord Goldsmith was around February 2006. The Downey case, as I understand it, was progressed some time in the summer of 2007 and the letter, certainly, was dated 20 July 2007. That is well over a year later. Q1852 Kate Hoey: Yes, but in February 2006, if someone is very clearly wanted for arrest and questioning in respect of serious terrorist offences, that doesn’t just go away in a year. Mr Hain: No. I completely understand, and that is probably why Mark indicated to me a few months ago, when I sought briefing from my former officials, that he was puzzled by it. That is why he had asked for a double-check to be made. Kate Hoey: We will take that up with him. Mr Hain: When the double-check came back and it said, “No. The letter should still issue”—I don’t want to put words in his mouth, but that is what I understand and recall him to have said—he did actually double-check. That is what he told me. Q1853 Lady Hermon: After he double-checked, he amended the letter without telling the PSNI. That is the key. Mr Hain: I don’t know that. Lady Hermon: Well, we do. Q1854 Kate Hoey: You mentioned earlier people about whom new evidence comes into existence. Do you realise that there is evidence around about Mr Downey, and particularly his involvement in Hyde Park ? Mr Hain: So I understand. Q1855 Kate Hoey: So you would be very happy to see him arrested and questioned about that? Mr Hain: I do not think it is for me, as a former Secretary of State, to comment on who should be arrested or who should not be arrested. I do not know the nature of the evidence—I have not seen it. Q1856 Kate Hoey: Tell me, Peter, when did you last have a conversation with Gerry Kelly? Mr Hain: I do not think I have spoken to Gerry Kelly since—I may have bumped into him if he was over in the House of Commons subsequently. I do not think I have had a proper conversation with Gerry since I left the post of Secretary of State for Northern Ireland in June 2007, and possibly before that. Q1857 Kate Hoey: So you have not been in any conversation or discussion, even informally, at a reception or anything, with Gerry Kelly over the past year? Kate Hoey: We are broadcasting to the nation, so who knows? Mr Hain: I have met a lot of former Northern Ireland political colleagues of all parties in the period since I stood down. Q1858 Kate Hoey: I understand that, but you are one of the Secretaries of State who would be on pretty good relations with certain leading members of Sinn Fein. Mr Hain: And with leading members of the DUP, and leading members of all other parties. Q1859 Kate Hoey: I appreciate that, and even with members of your own party. Mr Hain: Indeed, including some of the members of the parties who are questioning me quite properly this afternoon. That does not alter my respect for them. Q1860 Kate Hoey: Given that, do you think that Gerry Kelly has been badly advised to agree to appear in front of Justice Hallett because it is in private, but refuses to come and be seen by the public and by the victims? Mr Hain: I am not going to comment on what other people do or do not do. I have come before you here very openly to be questioned as much as you want to question me. I have come back after the vote and I will stay here for as long as you want to question me. Q1861 Kate Hoey: Okay. So you do not want to tell him privately that you think he is being rather misguided. Mr Hain: I have not talked to Gerry Kelly knowingly for years. Q1862 Nigel Mills: Mr Hain, as a preliminary, just tell us what you mean when you say that this was not an amnesty. What would an amnesty amount to? Mr Hain: An amnesty in my mind would be saying, “We know you’ve done something you shouldn’t have done. You’ve committed a crime. But we’re going to,” presumably by way of royal pardon or some other legal legislative mechanism, “wipe the slate clean on that and give you” what has been referred to, in my view totally inaccurately as far as the administrative scheme is concerned, “a get-out-of-jail-free card.” That is what I understand it to be. Q1863 Nigel Mills: Presumably when you say, “We know you’re guilty,” that must include “We suspect you may be guilty,” or, “We have grounds for thinking you’re worth pursuing.” You do not know that someone is guilty until they have been convicted, strictly speaking. Mr Hain: No, but if the PSNI tell you there is evidence sufficient to say they are still wanted, then nobody should, in my view, have got one of those letters. Of course not. The purpose of the letter was to say, “You’re not wanted”, as the Chief Constable has confirmed and the Attorney-General has confirmed. I agree with the current Secretary of State, Theresa Villiers, when she said, “none of the letters contained any amnesty, immunity or exemption from prosecution.” That was, by the way, in a written ministerial statement on 25 March this year. Q1864 Nigel Mills: Presumably if, as a matter of process, the police or the prosecuting authorities or whoever else chose not to pursue people, perhaps for political reasons, that would effectively amount to an amnesty, wouldn’t it? Mr Hain: For political reasons? Mr Hain: No, there was no pressure. Nigel Mills: —or it was deemed essential for the peace process. Mr Hain: No, this was only in respect of people who sought clarification as to their status: were they wanted or not? There could be no political interference in this process, nor was there. Q1866 Nigel Mills: Okay, I am just giving you scenarios. Presumably, assuming that there has been a competent inquiry and someone clearly was not wanted, you think it is perfectly normal policing to issue a letter in that situation. Mr Hain: I don’t know that it is normal policing to issue a letter, but Northern Ireland was not a normal place at this time. Q1867 Nigel Mills: I think you used the word “normal” earlier, which is why I used it. Mr Hain: The normal criminal justice process, as the Attorney-General has confirmed to the House of Commons, as the Chief Constable confirmed, and as I think others in authority who might have been involved in this process or whose officers or officials were involved in this process confirmed, was followed. In that sense it was normal. It was lawful. If you want to know whether you are wanted or not, you are entitled to inquire. Q1869 Nigel Mills: Presumably you would share people’s concerns if the process behind issuing that letter was not thorough or competent enough. Mr Hain: Of course I would. Q1870 Nigel Mills: I suppose that is where I get to my question. We have had the Historical Enquiries Team process going through all these offences. That effectively wasn’t part of the administrative process. We now know that the police, under Operation Redfield, will have to take three years to go over and review all these. Yet we saw under Operation Rapid a very quick process for issuing these letters. Are you not concerned that that could not possibly have been a properly competent way of determining if those letters were appropriate? Mr Hain: I am satisfied, with the exception of this case that has, quite properly, brought this whole inquiry of yours to a head, that the procedures involved were thorough. I cannot conceive of a situation in which a member of the PSNI and, presumably a member of the RUC before the PSNI was formed, or a law officer in the Attorney-General’s Department or a Northern Ireland official would knowingly have allowed somebody to get one of these letters, knowing that they shouldn’t be receiving it. No, I can’t conceive of that. These are people of the highest integrity. Q1871 Nigel Mills: I didn’t say knowing they shouldn’t be receiving one. I suggested that perhaps they couldn’t have done enough work to be capable of knowing that they should be receiving one. Mr Hain: I am sorry. Say that again? Nigel Mills: You suggested that they wouldn’t issue one knowing that it shouldn’t be issued. My question was whether they would have done enough work to be able to know that they should be issuing one. It is a very different thing. Mr Hain: All I can say is, so far as my Northern Ireland officials are concerned, I have the highest respect for them, including the ones involved in the end of this particular process—the highest respect. I don’t think there are officials of greater integrity or calibre in the civil service. Nigel Mills: We accept that. You have said that many times this afternoon. Mr Hain: Indeed, so, Nigel, I don’t think they would have cut corners. I don’t think they would have done anything that wasn’t in their view the right thing to do. Q1872 Nigel Mills: Okay. AC Sheridan gave us evidence earlier in this inquiry. He originally set out what he would like to do as part of the administrative process. I paraphrase his evidence. It involved interviewing people under caution who were on that list before concluding the inquiry. That was a process not accepted by Sinn Fein—I think there was correspondence with Gerry Kelly saying that wouldn’t be acceptable. Then we get the Operation Rapid process, where there were no interviews of people to see what evidence they had, to ask them about whatever evidence might exist. Do you think that shift change in the process, from wanting to interview people before you issued a letter to just doing a purely paper review, is a sign of normal policing? Mr Hain: I can’t answer for how the PSNI handled that except to say that Peter Sheridan and Hugh Orde are both police officers for whom I have the highest regard. I cannot recall offhand, although I have read his evidence, whether you put that question to Hugh Orde. Nigel Mills: I assume we did. Mr Hain: Because it is really a question for him. It is a question for the police. It is not a question for me. Mr Hain: As I understand it—I may be wrong—greater police time was devoted to this than had been the case before. Remember that in the case of Assistant Chief Constable Sheridan and others involved, they had a multitude of other responsibilities. They were dealing with all the issues that the PSNI has to deal with, so this was just one part of it. I cannot conceive, and I would be very surprised if your evidence said and the Committee reported, that corners were cut here. It may be—well, it certainly seems the case—that a mistake was made in the Downey case, and you will form your own judgment of why and how, but I do not believe that could conceivably have happened because corners were cut. I just cannot envisage that that would be the case. Q1874 Nigel Mills: I guess it just leaves us with this point: how come this process was moved from the Director of Public Prosecutions doing most of the file review and the concluding to it being a police process, and how come it was speeded up in that time? Mr Hain: As I understand it—if you tell me something different, it will be news to me—it was done in concert between the PSNI and the Attorney-General’s Office. Q1875 Nigel Mills: You were not aware of any discussions from No. 10 or from the NIO saying to the law officers and the police, “We need this speeding up. We want this process accelerating and getting done. It is really important that it is done quickly.”? Mr Hain: I have said on the record this afternoon that I wanted it speeded up. I was up against a deadline to achieve a peace settlement, which is what we achieved. Sinn Fein were engaging in a huge consultation—the leadership were— within their organisation as to whether they could persuade republicans to do something they had never done, historically, before: namely, signing up to support the principle of policing, justice and the rule of law on, of course, a devolved basis, which is what has now happened and has been operating for a number of years. It was absolutely important to try to get momentum in this, so that everybody bought in to the process. Q1877 Nigel Mills: So you don’t think that the Secretary of State saying to the Chief Constable, “Can you speed this up?” is putting pressure on them? Mr Hain: I remember saying to one of my officials, or maybe more, “Please can you accelerate this?” I think that was the main conversations that I had, but the idea that this would be done in a way that would somehow, as I say, shortcut or short-change the process is inconceivable. You are dealing with officials of the highest probity and confidence, and with police officers in the PSNI of, in my experience of the ones I have worked with, the same probity and calibre. I cannot speak for the Attorney-General’s Office, but they are normally in exactly the same ballpark. Q1878 Nigel Mills: It is surprising that they went into this process, perhaps. Mr Hain: You mean in the Downey case? Q1879 Nigel Mills: No, I am saying I just find it a little surprising that if the police were entirely happy with this, they didn’t know there were letters being issued, and that if the law officers were happy with this, they were not issuing the letters. Mr Hain: Can I just come to letters? I have asked myself why the individuals were notified in the form of letters rather than, say, a verbal communication. The civil service, quite properly, likes to put things on record, so that they can be checked. You are checking them now. In fact, they are preoccupied with that kind of process, quite properly, so that there can be proper accountability should there need to be. I suspect, though I was not involved and I cannot say authoritatively, that the form of communication, the form of the letters, was so that the person receiving the letter knew where they stood and knew that it was not an amnesty or a get-out-of-jail-free card, to use all these terms that are bandied about by politicians—doing, I think, grave disservice to the victims in these cases, by the way. It was so they knew where they stood—they had it in writing. In this case that has caused all this furore, you are now checking what was said to Mr Downey. That is why the letters were sent. I do not think there is anything particularly novel about civil servants sending letters. Q1880 Nigel Mills: Surely you would have preferred, if this was a normal part of the criminal justice process, for somebody normally involved in that process to be issuing these letters. Do you not think it was a little concerning that the only person prepared to sign them was in the NIO political department? Mr Hain: No, I am not accusing any member of this Committee of being naive, Chairman. Lady Hermon: Well, you are. Mr Hain: I am not. I am saying that there is a naivety in not understanding the politics of getting a process over the hill given Northern Ireland’s bitter and tangled and very difficult history, and expecting that everything has been done as it would be in Shepton Mallet or in the middle of Mayfair—in societies where you do not have this record of conflict, going back generations and centuries. Q1881 Nigel Mills: But that is the reason for the question, Mr Hain, isn’t it? I am sure that if you could have said to Sinn Fein, “We can’t pass this Bill, but I’ll get the Director of Public Prosecutions or the police to review the files and write to those who aren’t wanted,” that would have been an unusual thing to do, but it would have been normal. Mr Hain: No, but as I explained before, you are conflating the two categories. You could not deal under the administrative scheme with the people who are wanted by the police and against whom there was evidence that the police held. They had to be dealt with under the judicial process established by the Northern Ireland (Offences) Bill. The administrative scheme could not address their cases. In the couple of dozen or so cases that those whose names came before in this way came to the attention of the PSNI and the law officers and so on, no letters were issued, because they were still wanted. That shows to me that the process is operating, actually, as it should do. Q1882 Nigel Mills: If the system could not deal with people who were wanted and should have been wanted, why would the Director of Public Prosecutions or somebody in the police not be willing to issue the letter saying, “You’re not wanted.”? Why did it have to be a political official? Mr Hain: Because, as I say, this was Northern Ireland. That is the way it was done. Q1883 Chair: That does suggest that the Northern Ireland Office were involved in the judicial process. Mr Hain: No. The Northern Ireland Office were at the end of—we were involved in a political negotiation to bring about peace and the end to war and conflict and terror. That is what we were doing, and I make no apology for it. That is what my officials were supporting me as Secretary of State, and other Secretaries of State, in doing. As I understand it, Sinn Fein put forward names; those names were then checked, and at the end of it the Northern Ireland official concerned wrote to the individual, and you have seen an example of that letter. That is certainly, I think, what was happening under my watch. The process evolved over time. Q1884 Nigel Mills: But you can see how people are concerned that, perhaps, the police and the law officers were somewhat concerned about how legitimate this process was: they did not really want to be implicated. Mr Hain: No, that was never suggested—never suggested to me. Mr Hain: No, we all were and I was very clear this had to be done and, to quote the current Attorney-General in February this year and to quote the Secretary of State for Northern Ireland in March this year, this was a lawful process. It was not an amnesty. It might have been unusual—yes, I accept that—but it was part of the normal criminal justice process, and nor could it have been done in any other way, nor would I have asked my officials to do anything in any other way; nor would the Attorney-General have tolerated that; and nor would the Chief Constable, as he has told this Committee, have tolerated anything that was not perfectly lawful and in line with the normal criminal justice process. Mr Hain: But is he saying that about the current situation in Northern Ireland? Mr Hain: They were outside UK jurisdiction. How could they be questioned? Mr Hain: No, I’m sorry. What we did, in a process of absolute integrity, was the necessary checks. Out of that, the majority of cases received the letters; a significant number did not, because the police did have evidence against them and they could not be processed under that administrative scheme. If I may say so, that shows that it was a scheme of the highest integrity. Otherwise, a blank cheque would have been written to everyone, and it could not be, because that would have transgressed the normal criminal justice process. Q1889 Nigel Mills: One final point from me is that these letters that were issued effectively say, “You are not wanted for any pre-’98 Good Friday Agreement offence.” That creates a different issue, doesn’t it? If I wrote to the police and said, “Do you still want me for x offence that you think I may have committed?” they only review the file for the one offence that we know we are talking about. But if you are effectively giving a letter that covers every offence pre-’98, the police could not possibly have been going through and reviewing every file to see who was potentially involved in any possible offence. It just looks like an impossible exercise to give that kind of confirmation. Q1890 Chair: On that point, Mr McGrory said last week: “I have no doubt that many people received letters saying that they were not wanted who, in ordinary circumstances, the police would have liked to speak to.” You may or may not call that an amnesty, but it is pretty close to it. Mr Hain: Did he describe it as an amnesty? Q1892 Chair: No, but I am saying it is pretty close to one. These are people “in ordinary circumstances, the police would have liked to speak to.” You are saying that the criminal justice system was followed ordinarily; Mr McGrory suggests that the police would actually have liked to have spoken to those people. Do you accept that that puts us in some difficulty as to what to believe? Mr Hain: I accept that he said what he said, but I would observe that the current Attorney-General said that this was entirely lawful and that it was not an amnesty—as has the Secretary of State and many other people, including the former Chief Constable, Sir Hugh Orde. Q1893 Chair: The Attorney-General said that after I forced him to make a statement in the Commons on an urgent question when he was not actually going to give one, and was perhaps not fully prepared. We will put that to him, but I do not think that necessarily supersedes Mr McGrory’s view. Bear in mind Mr McGrory’s previous role in the on-the-runs issue. Mr Hain: I am not here to countermand or have an argument with Mr McGrory. Chair: No, I just wanted to put that point to you. Mr Hain: I think this was a necessary part—a lawful, honourable, necessary part—of the process of getting a settlement. It is important that I put this on record, if I have not said it before: I do not think that we would have got that settlement had I not attempted to introduce the Northern Ireland (Offences) Bill, and then, when Sinn Fein said they did not want it proceeded with—as we had an obligation to under the Agreement—to withdraw it. I do not think we would have got the eventual settlement if we had not had the administrative scheme operating and if we had not tried to address the anomaly under the Northern Ireland (Offences) Bill. Q1894 Nigel Mills: When you were discussing these letters and this scheme with Sinn Fein, what was your understanding of what they understood the letters were meant to mean? Mr Hain: I don’t think I ever had a discussion about letters with Sinn Fein. I cannot recall whether it was with Gerry Adams, Martin McGuinness or Gerry Kelly at the time I was Secretary of State. I cannot recall discussing letters. I think that we were talking about the administrative scheme in general. Q1895 Nigel Mills: So when you had discussions with them in general about this, which obviously led to you asking for this to be speeded up, what were they seeking to get? Presumably they were not just seeking to get a one-day confirmation that someone could change their mind on the next day. Mr Hain: No, they knew they would not get that. What they were wanting to know was whether the individuals were wanted or not, and whether they could come back into UK jurisdiction or not. Remember that, as far as I know, none of them were within UK jurisdiction, yet the judgment of the Sinn Fein leadership was that they were important to getting buy-in from republicans, given the history of the conflict. The rights and wrongs of it are not the issue here. Mr Hain: Getting buy-in from all the republican movement, which is what was achieved, and it was an historic achievement. Mr Hain: No, I am not sure you do. Mr Hain: No, no, no; it was not immoral and nor was it horrible. It may have been unusual, but it was not immoral. Mr Hain: It was lawful, it was honourable, and it was done with total integrity. Q1897 Nigel Mills: I was just trying to work this out. Presumably Sinn Fein would not have been happy if someone got a confirmation that they were not wanted today, and then at some point in the future a re-review of the file was done or a different prosecutor reconsidered things and arrested them. Q1898 Nigel Mills: And the prosecution got stayed, yes. This is kind of the problem we are getting to. Were these letters really meant to be, “We don’t want you for a pre-’98 offence and we are not going to want you in the future for one, unless we find a different offence we hadn’t thought about, or unless something new turns up”? Mr Hain: All I can say is that those letters satisfied the recipients, including the Sinn Fein members. I think—though don’t hold me to this if someone says others were involved—it was mostly Gerry Kelly who was involved in communicating. Nobody ever objected to me that there was a flaw in the process from Sinn Fein—nobody did. Chair: We have three more questions. Out of respect for the witnesses who are going to come before us very shortly and have waited a long time, can I ask for brief questions and brief answers, if I may? Q1899 Lady Hermon: Peter, you have repeated in recent minutes the words “lawful” and “honourable” about the process. If this was such an honourable and lawful process, why on earth did you, as Secretary of State, deliberately omit any reference to this administrative scheme and to these letters when you were making replies to legitimate and proper parliamentary questions? Lady Hermon: No, you haven’t, Secretary of State. You have not. Mr Hain: And I have answered the question repeatedly to you, Sylvia. Mr Hain: Former Secretary State. Lady Hermon: Former Secretary of State, with whom I had a very good working relationship. Q1900 Lady Hermon: Which is why I am so annoyed by this. You have repeated that this was a lawful and honourable process several times. Lady Hermon: If it was such a lawful and honourable process, you have also said—I took it down—that it was quite proper for Northern Ireland officials to issue letters. That is what officials do. They put things into letters. Mr Hain: So there is certainty. Q1901 Lady Hermon: Why did you deliberately omit reference to all that? Mr Hain: I don’t accept that. Q1902 Lady Hermon: Sorry; you deliberately omitted reference. Mr Hain: No. You asked me a question and I answered it truthfully and honourably. You have said this in a letter to me, but I do not accept that I misled anybody. I am a former Leader of the Commons. Am I likely to mislead anybody deliberately? Of course not. Q1903 Lady Hermon: Well, why were you economical, then, with the facts? Mr Hain: I don’t think I was economical with the facts. Mr Hain: Can I just say that the answers you received, particularly the written answers, were drafted by my officials? Is anybody suggesting that civil servants of the highest integrity and calibre would allow me deliberately to mislead you, even if I had wanted to, which I never would have done? Q1905 Lady Hermon: With the greatest respect, Peter, these officials have also been involved in the administrative scheme, and they have deliberately and wilfully—for whatever reason—decided to keep this quiet. It is deeply offensive. Mr Hain: I cannot accept that. Lady Hermon: It’s a fact. Mr Hain: One of my hallmarks, of which I was proud as a Minister, is that I stood by my officials. In this case, I cannot accept that criticism of them. They were officials of the highest integrity. There were not seeking to mislead anybody. Q1906 Lady Hermon: So why do you think no reference was made to the administrative letters and that in fact Northern Ireland Office officials issue letters? Why was no reference made to that? Mr Hain: I don’t think it occurred to any officials or to me to talk about letters. We talked about a scheme, which John Reid first mentioned on 1 July 2002. Anyway, I have repeated all that. I take great offence at any suggestion that I or my officials deliberately misled anybody. Chair: Can we move on now? We really will have to close the session soon. Q1907 Ian Paisley: Do you accept that today a prima facie case has been established that there were documents to show that you may have known about the John Downey case, although you may have forgotten about it? Mr Hain: Well, you have read out the letter that I don’t recall. Q1908 Ian Paisley: Also in that letter was an indication that a reply would be sent. Would you be willing to seek out whether a reply was sent on your behalf, or indeed was signed by you? Mr Hain: I think this is a matter for the Committee to pursue, if you wish to pursue it. Q1909 Ian Paisley: If there is a prima facie case, you would therefore accept that with the statement that you signed on 30 January this year for Justice Sweeney, and which was presented to Justice Sweeney, you might have inadvertently perjured yourself? Mr Hain: No. Ian, I have a lot of respect for you. Outside this Committee I regard you as a friend. That is an outrageous suggestion to make. It is outrageous and I demand you withdraw it. Mr Hain: I demand you withdraw it. Q1910 Chair: Order. I think the word “inadvertently” was used. I think the suggestion was that the memory was forgetting, because the letter is there. Mr Hain: That is outrageous—absolutely outrageous. Chair: I think the suggestion was that it was inadvertent. Mr Hain: I have come to this Committee in good faith. I have stayed for extra time, as you have asked me to do. I will answer all your questions, but that is outrageous. Q1911 Ian Paisley: In paragraph 11 of the statement to the court, you make it very clear that the first time you became aware of this was whenever the trial broke down. Mr Hain: I think I had better consult the statement. Let me do that. Do you want me to read it all out? Why don’t I, since you have selectively quoted from it? It says: “I have been made aware that John Downey, an ‘On The Run’ applicant in July 2007 received a letter in the same terms as other persons at the same time. I have seen the letter, which in phraseology repeated in letters to many applicants previously, provides an assurance that he was not liable to arrest if he entered the jurisdiction. On its face it informed him that he was not wanted in the north of Ireland. Nor was there any interest from any other police force in the United Kingdom (on the basis of information from the PSNI). I confirm that was the assurance that was intended by the Government to be understood by the recipient of such letters”. What’s wrong with that? Q1912 Ian Paisley: That statement says that the first time—this was my first question to you today—that you became aware of John Downey was around December 2013. Q1913 Ian Paisley: No, but that is what it implies and that is what you accepted earlier on. I accept that that is what you said. Ian Paisley: And therefore may have perjured yourself inadvertently. Mr Hain: No, no, no; I’m going to answer this, frankly. Regardless of whether I recall, and I don’t, that letter—honestly, and you simply have to accept that that is the case. I wasn’t briefed on that letter by the officials I saw a matter of a few months ago. Nothing in that letter applies—I don’t say in this paragraph, “Oh, by the way, I received a letter in February 2006,” if that’s the date, “but I am actually contradicting it because this is the first time I have heard of it.” It does not say that at all. Mr Hain: Yes, but in February 2006, John Downey was not in receipt of a letter. This statement here stands. Q1915 Ian Paisley: He received the letter in March 2006, a month later. Ian Paisley: He received his letter in March 2006, a month later. That was when John Downey received his letter. Q1917 Ian Paisley: Do you think you have a duty to go back to the court and tell it this? Mr Hain: I have made it clear that, as Secretary of State, it was not, nor would it have been, proper for me to have interfered with, intruded into or been informed about the progress of individual cases. That would really have laid me open to justified criticism by you, Ian, and members of this Committee. Of course it would have done. That would be a political figure intruding or inserting himself or herself into the normal criminal justice process. It is a matter for the police and the law officers, not a matter for politicians. Chair: We really have to move on, so I am going to close the session. It has been very useful, Mr Hain; thank you very much for joining us.